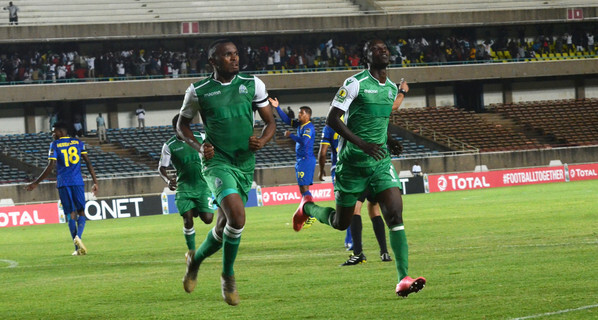 Gor Mahia defied all odds, playing with nine men, to beat Angola’s Petro Atletico 1-0 at the Moi Sports Centre in Kasarani on Sunday night to qualify for the Quarter Finals of the CAF Confederations Cup for the first time in their history. Jacques Tuyisenge scored the lone goal from the penalty spot in the 56th minute with Gor having to finish the game without Ernest Wendo and Shafik Batambuze as well as their coach Hassan Oktay. Wendo was sent off after 35 minutes following a high tackle on Vladmir Etson after miscontrolling the ball while coach Oktay was sent off for furiously protesting a referee’s decision. Batambuze was sent off in the 74th minute for a second yellow card. The two will now miss Gor’s first leg quarter final match and this will be both their second suspensions in the tournament. The first half was highly tactical with few chances, each of the two sides sizing each other. Petro had most of the clear chances at goal with Gor having two, which didn’t provide much of threat. They should have had a second 10 minutes later when Tuyisenge was teed up by Francis Kahata but his venomous hit from range rattled the woodwork. Gor’s march was slowed down when left back Batambuze was shown a red for a second yellow. But, they did not lose hope playing with heart and had another chance with Lawrene Juma’s shot from range hitting the frame of goal again. Gor now join Zamalek in the last eight with the Egyptians having held NA Hussein Dey to a 0-0 draw in the other group match.The quarterfinals draw will be conducted on Wednesday 20th March.